Oscar Pistorius wept as the State inadvertently showed pictures of his dead girlfriend on a screen next to him in the High Court in Pretoria on Thursday. When prosecutor Gerrie Nel indicated that a visual was being sought for his line of questioning, Pistorius bent over and held his A4 notepad over his head. Visuals of Reeva Steenkamp's body were briefly seen on the screens positioned around the court along with images of a gun, the bloodied toilet cubicle floor and bullet casings. A loud noise was heard coming from Pistorius and his face and neck were red. 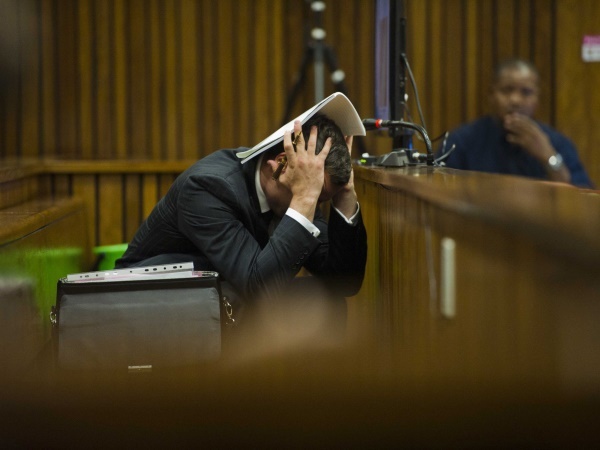 Earlier this week, he retched repeatedly as pathologist Gert Saayman described Steenkamp's injuries after he shot her dead while she was in the toilet adjoining his bedroom. When Saayman testified, the court referred to printed photographs distributed among them in a file. Police forensic analyst Colonel Johannes Vermeulen, who had been testifying on the door Pistorius shot at, was released from giving evidence shortly afterwards. Judge Thokozile Masipa allowed an adjournment for the preparation of other photographs. Pistorius stood up for Masipa's exit from the court with her assessors and as soon as the police officer maintaining order gave the all clear, Pistorius wiped his mouth and his sister Aimee went to him to comfort him. His co-counsel Kenny Oldwadge joined him. Pistorius is accused of the premeditated murder of model and law graduate Steenkamp in his home on February 14 last year.